If you're a business providing a fixed service, it's likely that you may want to invoice some of your customers the same amount. 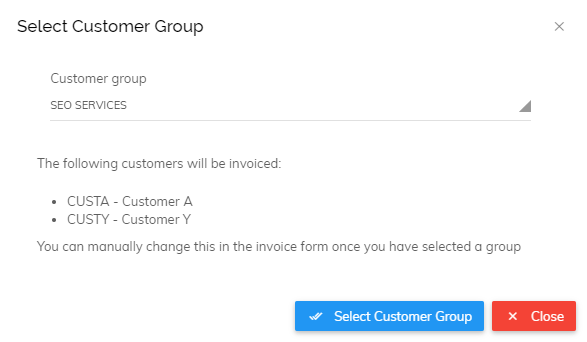 So, rather than creating an invoice for each customer individually, customer grouping in Pandle allows users to send an invoice to a group of customers in one go. Users who invoice the same amount to a group of customers on a regular basis can also use customer grouping under Pandle's recurring invoice feature. This will allow invoices for the same amount to be sent to that group of customers at regular time intervals. This is handy for businesses who have set prices, packages or work on a subscription model. You can then simply name the group and click 'save customer group'. 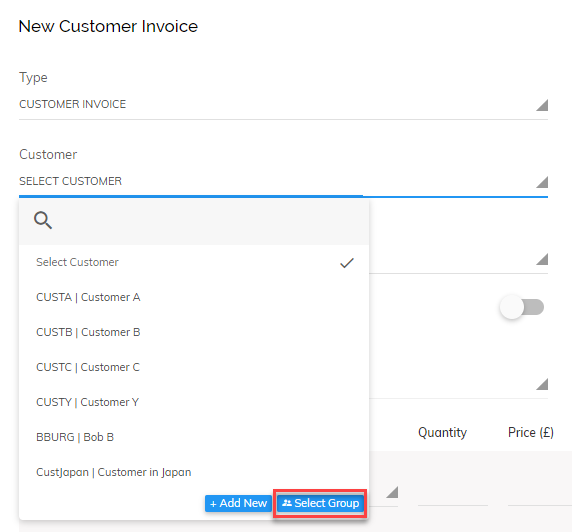 To assign existing customers to a group simply click the edit icon next to the relevant customer, specify the group you want to add them to and click 'Save Customer'. Please note: Only customers with the same currency can be included in a group. You can have a group of USD customers and a group of GBP customers but you cannot combine the two. Once you have created your first group you will have the option to add new customers to a group when you are creating the new customer. Invoicing a group of customers is done in the same way as you enter individual customer invoices. When creating the invoice, simply click select customer group. Then choose the group you would like to invoice. Please note: if you leave the due date blank then the individual customer default due dates will be used for each invoice. If you enter a date, all invoices created will be due on the date entered. To view invoices created for a group, you begin in the same way as viewing individual invoices. For this, you go to Enter Transactions > Customers tab > View > Invoices. 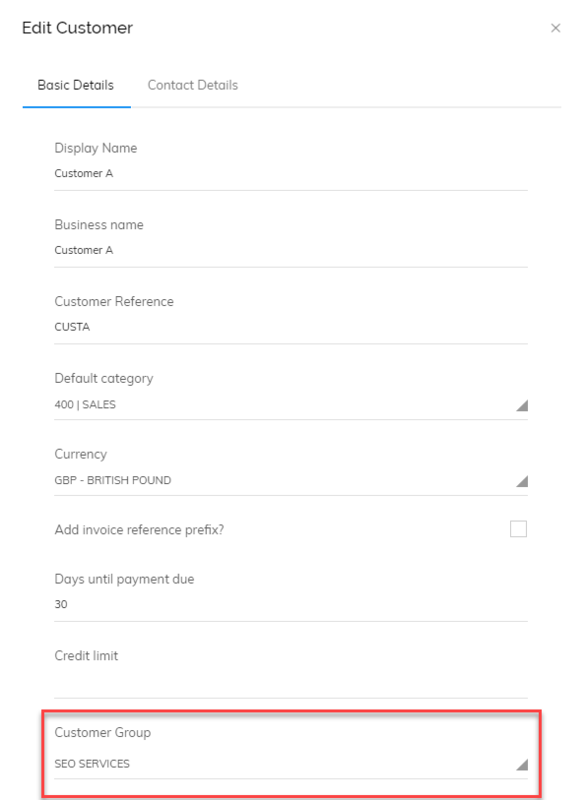 In the list you will see that group invoices are shown under the type and customer. 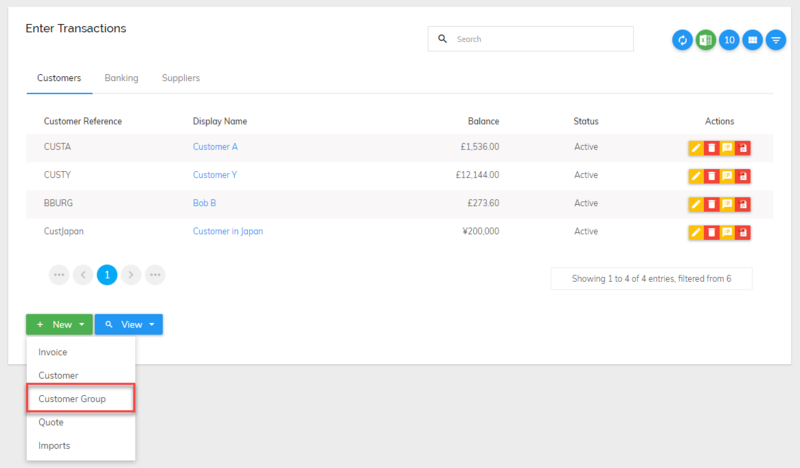 You can also see all the individual invoices in the group by clicking on the view button. To drill down into the individual invoices, simply click the description link. Recurring group invoices can be done by creating a group invoice as above and by clicking 'Save and Recur' or by going to Tools > Recurring Transactions and setting up a new one.